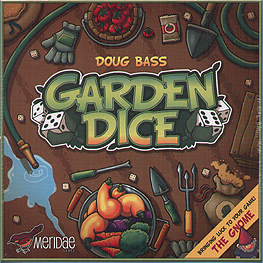 In Garden Dice, you are gardeners toiling to coax the best crops from a shared plot of land. You'll take turns rolling dice and using them to perform actions such as buying, planting, and watering seeds; harvesting vegetables; and moving hungry critters to gobble up your opponents' hard work. When there are no seeds left in the supply, you'll compare the fruits (well, vegetables) of your labours to see who's got the bumper crop. More fun than you thought gardening could be, unless you thought gardening was really really fun. Tons of bountiful seeds and plump veggies. Well, not actual seeds and veggies, but tiles representing them.